It is with deep regret that I just learned that my mentor, friend and, in many ways, kindred spirit, John Betts, passed away peacefully this morning (August 31st, 2018) at his home surrounded by family. John was an amazing person and will be greatly missed by everyone who knew him. Rest In Peace my friend. 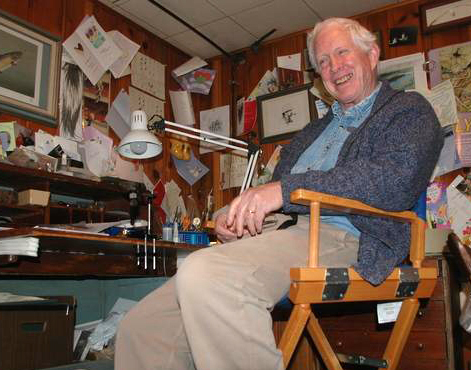 John Betts is a life-long angler, fly tier, author, artist, philosopher, inventor, and truly a Renaissance man. He was a pioneer in the use of synthetic materials for fly tying in the 1970s, builds wonderful strip-built wooden rods, invented a unique fly line that is inexpensively and easily made, and hand-crafts fly reels. He was chosen as Fly Rod and Reel's "Angler of the Year" in 2006, a well-deserved recognition of his unique contributions to angling world wide. John has self-published four books - three of which have been re-published by Reel Lines Press (Synthetic Flies, Flies with an Edited Hackle and Catch the Hatch) and the fourth (Making Strip-Built Fly Rods from Various Woods on a Lathe) by Frank Amato Publications. He has written countless magazine articles and was a pioneer in the use of synthetic materials in fly tying. John was honored as Angler of the Year by Fly Rod and Reel Magazine in January, 2006.